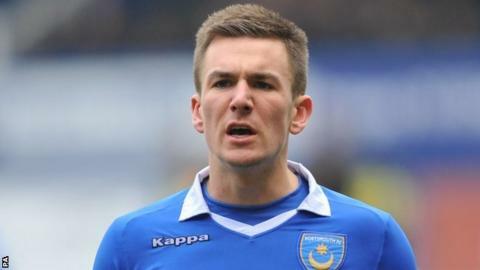 Michael Drennan scored twice as Portsmouth defeated Dagenham to win their third consecutive match and edge five points clear of the drop zone. Pompey took an early lead as Danny Hollands fired home before Drennan headed into an empty net following Jed Wallace's audacious chip. Abu Ogogo's header halved the deficit but just before the hour mark Drennan smashed in a 25-yard half-volley. Wallace latched on to Luke Wilkinson's short back pass to round off the game. It was a blow for Dagenham's slim play-off hopes and they now sit eight points behind seventh-placed Oxford with four matches remaining. "That's the best we've played by a street....I asked them after the Newport game to maintain the levels, and could they nudge it higher. "We did that against Hartlepool and I challenged them again to do the same. The standard now has gone even higher. They keep raising the bar for me. "They've been absolutely superb today, each and every one of them. Not just the 11 and the three we've put on, but every single body in the group. They've been an absolute pleasure to work with. "It's a great result but we're not quite there yet. It's another big step towards safety." Patrick Agyemang (Portsmouth) wins a free kick on the left wing. Foul by Luke Wilkinson (Dagenham and Redbridge). Attempt saved. Chris Dickson (Dagenham and Redbridge) right footed shot from outside the box is saved in the bottom right corner. Foul by Gavin Hoyte (Dagenham and Redbridge). Foul by Rhys McCabe (Portsmouth). Attempt missed. Abu Ogogo (Dagenham and Redbridge) left footed shot from the centre of the box is too high. Goal! Dagenham and Redbridge 1, Portsmouth 4. Jed Wallace (Portsmouth) right footed shot from the centre of the box to the centre of the goal. Assisted by Rhys McCabe. Substitution, Portsmouth. Patrick Agyemang replaces Ricky Holmes. Substitution, Dagenham and Redbridge. Afolabi Obafemi replaces Luke Howell because of an injury. Corner, Portsmouth. Conceded by Brian Saah. Corner, Portsmouth. Conceded by Gavin Hoyte. Corner, Portsmouth. Conceded by Jack Connors. Substitution, Portsmouth. Johannes Ertl replaces Michael Drennan because of an injury. Attempt missed. Danny Hollands (Portsmouth) left footed shot from the left side of the box is close, but misses to the right. Attempt saved. Luke Howell (Dagenham and Redbridge) left footed shot from outside the box is saved in the centre of the goal. Corner, Dagenham and Redbridge. Conceded by Nicky Shorey. Substitution, Dagenham and Redbridge. Adebayo Azeez replaces Sean Shields. Attempt saved. Ryan Taylor (Portsmouth) header from the centre of the box is saved in the centre of the goal. Goal! Dagenham and Redbridge 1, Portsmouth 3. Michael Drennan (Portsmouth) left footed shot from outside the box to the bottom right corner. Assisted by Rhys McCabe. Foul by Nicky Shorey (Portsmouth). Corner, Portsmouth. Conceded by Luke Wilkinson. Danny Hollands (Portsmouth) wins a free kick in the attacking half. Attempt saved. Jed Wallace (Portsmouth) right footed shot from outside the box is saved in the centre of the goal. Second Half begins Dagenham and Redbridge 1, Portsmouth 2. First Half ends, Dagenham and Redbridge 1, Portsmouth 2. Corner, Portsmouth. Conceded by Chris Lewington. Attempt saved. Ryan Taylor (Portsmouth) left footed shot from a difficult angle on the left is saved in the bottom left corner.